Today, the Tampa Bay Buccaneers added John Hughes III, according to Greg Auman. 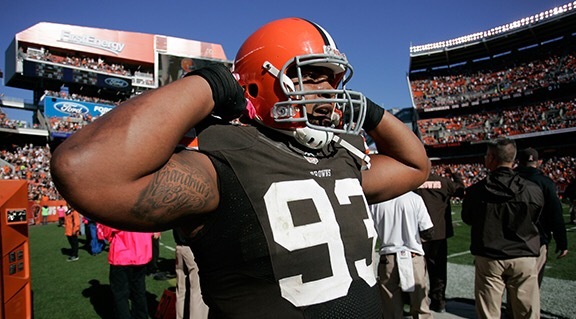 Hughes was once a third-round pick by the Cleveland Browns back in the 2012 NFL Draft. He was released by the Browns on September 20, 2016, and seven days later he signs with the New England Patriots for less than a week. With Noah Spence and Gerald McCoy leaving the game against the Denver Broncos with injuries,and also Robert Ayers out with a current injury. The Bucs had to go out into the market and sign the big run stopper. In addition, Hughes is the man the Bucs need next to Clinton McDonald and Gerald McCoy, as he is a dominant run stopper that has limited success in the pass rush area. Finally, Hughes has not record a tackle this year, but in his career, he has 5.5 sacks, forced one fumble, and 105 tackles.